The Department of Writing and Rhetoric welcomed back the start of fall classes with donuts and bottled water for all students and instructors. On Monday, August 25 and Tuesday, August 26 representatives from the department passed out donuts and bottled water at each of the Lamar entrances. 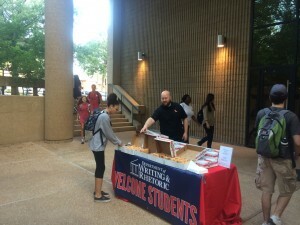 This was a celebration of not just the students being back on campus, but also the Department of Writing and Rhetoric offices, classrooms, and the Writing Centers all being located in Lamar together. Students were very appreciative to have some brain fuel on their first days of classes. Brad Campbell welcomes students with donuts. 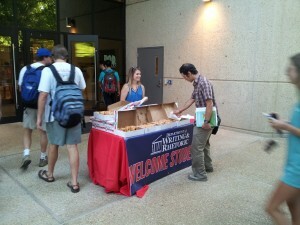 Joanne Mitchell welcomes students with donuts.